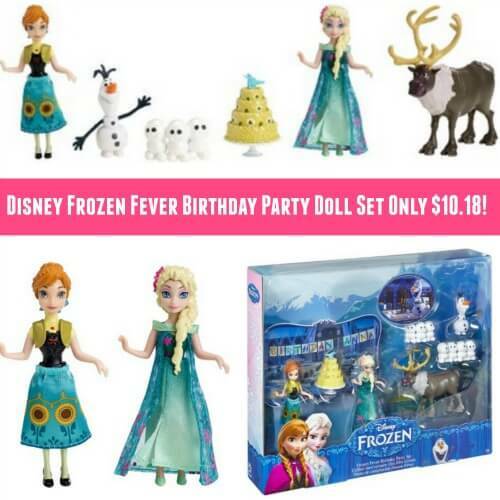 Home / Deals / Online Deals / Amazon Deals / Best Price on a Disney Frozen Fever Birthday Party Small Doll Set! I have a HOT deal for you right now on this great Disney Frozen Fever Birthday Party Small Doll Set on Amazon! Right now you can get this great Frozen Doll Set for only $10.18 + FREE shipping with Amazon Prime! This Disney Frozen Fever Birthday Party Small Doll Set is regularly priced at $25, but right now it’s on sale for just $10.18. You can get FREE shipping with Amazon Prime but if you want to get it for Christmas, you can pay for 1 day shipping as well! Disney Frozen Olaf-A-Lot Only $6.98!